(Newser) – Health officials in Indiana and Kentucky say they are investigating farms, distributors, and retailers after an outbreak of salmonella that has killed two and sickened at least 141 people nationwide was linked to cantaloupe grown in southwestern Indiana. 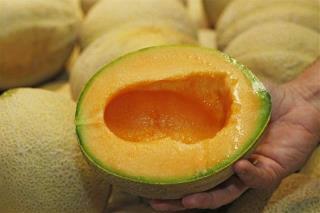 Officials yesterday advised all Indiana residents to discard cantaloupes purchased since July 7. The Kentucky Department of Public Health warned people not to eat the cantaloupes. So how does one tell an Indiana or Kentucky melon from all the others? Need some help here, USGov.